Thousands of Commonwealth Games spectators, athletes and officials arriving at Gold Coast Airport across the Easter weekend will be welcomed with a personalised performance from Bleach* Festival. 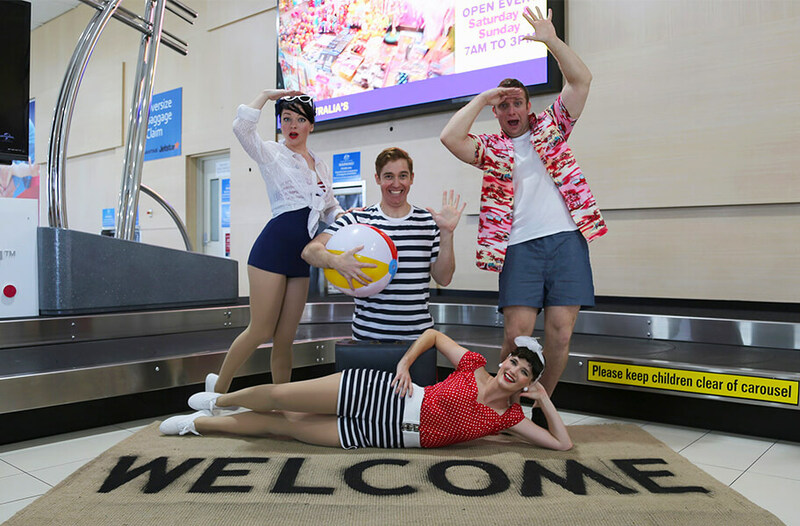 In an Australian airport first, lively, colourful performers participating in The Welcome Party will greet visitors to the city as part of a production curated specifically for Gold Coast Airport. Bleach* Festival Artistic Director Louise Bezzina said the aim of the performance was to give visitors a unique taste of the Gold Coast when they arrived during this particularly important time for the city, in the lead up to GC2018. “We wanted to develop a really special and bespoke performance for the Gold Coast Airport that introduced visitors to our city’s playful and vibrant personality,” Ms Bezzina said. Gold Coast Airport General Manager, Operations and Service Delivery, Brett Curtis said hosting The Welcome Party was an exciting and unusual opportunity for the airport. “Gold Coast Airport has been a long-term supporter and sponsor of Bleach* Festival, and this is the first time we have worked in partnership to create a production that is unique to the airport,” he said. The broader entertainment schedule at Gold Coast Airport includes live music, wildlife presentations, indigenous performances and stilt walkers roving throughout the terminal and GC2018 Airport Lounge. Mr Curtis said the terminal was alive with activity in the lead up to GC2018 and Byron Bay Bluesfest. “Our entertainment program is in full swing and the terminal is brimming with GC2018 volunteers and our own volunteer ambassadors, as well as passengers attending the Games and Byron Bay Bluesfest,” he said. Ms Bezzina said The Welcome Party coincides with the commencement of Festival 2018, an 18-day, city-wide celebration spanning major musical concerts, large contemporary dance productions, giant outdoor spectacles, and more.